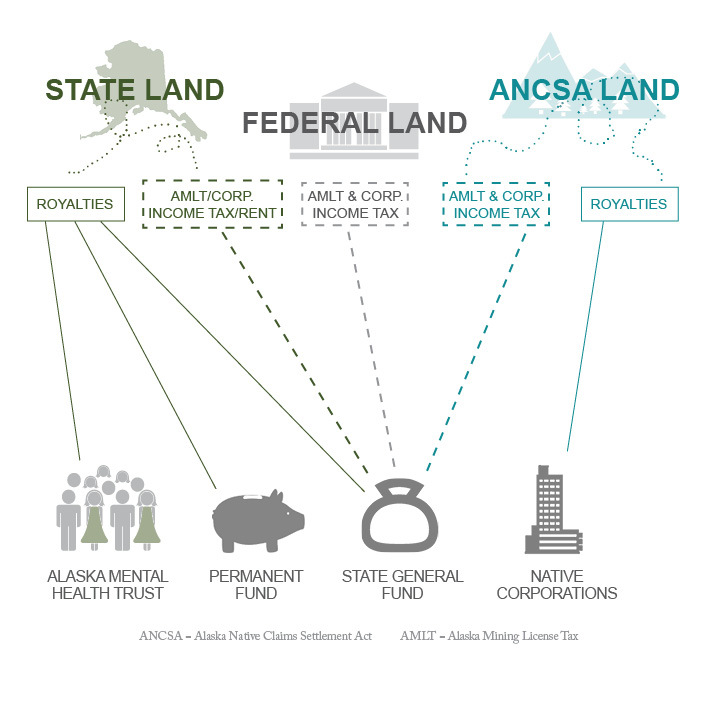 Mining is an integral part of Alaska’s growing, diverse economy, and today mining revenues are a substantial top source of corporate tax payments to Alaska state government, in addition to providing substantial revenues to local governments around the state. Mine spending also provides a tremendous economic boost to remote, rural regions of Alaska where there is limited potential for other new investment, development or job creation. The secondary benefits of mining operations are felt across the economy in the transportation, retail, engineering, construction, supply and services sectors, where large and small businesses hire workers and invest in equipment and facilities as part of their work for the mining industry. 4,350 direct mining jobs in Alaska. 8,600 total direct and indirect jobs attributed to Alaska mining industry. $675 million in total direct and indirect payroll. $111 million in payments to Alaska Native corporations. $81 million in state government-related revenues through rents, royalties, fees, and taxes. Mostly year-round jobs for residents of more than 50 communities throughout Alaska, half of which are found in rural Alaska where few other jobs are available. Some of Alaska’s highest paying jobs with an estimated average annual wage of $108,000, over twice the state average for all sectors of the economy. $23 million in local government revenue through property taxes and payments in lieu of taxes. Thousands of Alaskan families earn a living working directly for mines, and thousands more are employed in mining industry support jobs. As important as the total numbers employed, the geographic footprint of mining employment is also significant; residents of more than 50 communities, often in rural areas where few other jobs are available, are employed in the industry. The social benefits can be far-reaching for isolated communities; in highly disadvantaged, rural areas of the state, mining exploration and development jobs can provide opportunities that simply would never exist otherwise.